A website SEO tune-up for New Path 2 Wellness. Target keyword for her site: Lymphatic Massage Paso Robles. Jan. 12, 2013 – Kris Allen is a long time friend of ours. So, when she called to talk about how to improve the search engine optimization of her site we were eager to talk with her. Kris is a massage therapist here and understands the need for SEO, but is working on a limited budget. She knows we have been working for sometime on SEO in Paso Robles. She asked us if we could spend a few hours doing onsite optimization. That’s a more affordable option than building a new site, but does have some challenges. Her website is hosted though an Intuit business website platform that she signed up with through the Intuit accounting software company. The options of Intuits client management system (CMS) are pretty limited. We normally follow the steps outlined in this article I recently wrote: Local SEO in San Luis Obispo County. We’ve found these to be incredibly effective tips. The Google listing showed her business as “Home” instead of “New Path 2 Wellness” because the title of her home page was “Home.” So updating that was a priority. 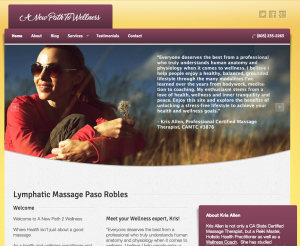 New home page title: Lymphatic Massage Paso Robles | New Path 2 Wellness | Paso Robles, CA 93446. Description: Therapeutic Massage in Paso Robles. This was an entry field for the Intuit CMS. I’m not sure it is useful for SEO in Paso Robles, but I posted in the field and will be checking the HTML and look for a change. Meta Keywords: lymphatic massage paso robles, paso robles massage, day spa, massage, aromatherapy, body treatments, men, therapeutic massage. This was actually a major cut back. There were probably 50 keywords in this copy. Many of them were unrelated to her business and probably a default from Intuit. It may have contributed to keyword dilution. H1 tags: I would normally like to write an H1 tag with the targeted keyword, but that was not an option I could find in this software tool unfortunately. Art: I replaced a photo with an identical image with a new title “massage-paso-robles.jpg.” The CMS would not let me add an alt tag. Footer: I created a link in the footer of all pages “Lymphatic Massage Paso Robles” that links to the home page. I updated her business name, address and phone to identically match the Google+ Local listing. Social media: I added links in the sidebar to Facebook and Google+ business pages. Google+ Local listing: I added an additional link to the Google+ Local listing linked to the text “lymphatic massage Paso Robles.” Body copy: I did some research on the term “massage.” I looked at words similar to it that are in the body text of the top 10 ranking sites in the nation for “massage.” I used at tool at http://lsikeywords.com/. It prompted me to add words like: health benefits, therapeutic massage, professional, certified. I copied and pasted all the copy to a MS Word Doc so I could double check spelling and word count. I increased overall word count to 275 from 240 and corrected a few typos. I did a search for massage and noticed it almost 17 times in the text and went back to cut it back a bit to avoid keyword stuffing. I made the cutbacks in places where the word wasn’t need for a targeted keyword or natural language. About us and Services pages: I updated the title and made a few touch ups to the copy and footer, but focused most of my time on the home page. Linking: I created new inbound links to the site from Google+, pasoroblesdailynews.com, northcountyaccess.com, slovisitorsguide.com, Facebook, Twitter and this site. I created a Yelp profile for her, but Yelp has not indexed it yet. I asked Google to re-crawl the new URL. I gave Kris some tips for easily generating 10 new links with her twitter account. Check back: Jan. 12, 2013 – In about three days I will re-run the ranking report and post results here. Jan. 14, 2013 – The Google+ Local listing for her keyword jumped immediately to the A rank. Wow! I’m not convinced this will last since it is such a big jump, but impressive none-the-less. I can’t find her organic URL in the search engine results. This page and the pasoroblesdailynews.com page are both ranking on the second page. So, I return to her CMS and make a few more changes. I realize that the word “massage” could be overused so I cut back a bit.